A breathing monitor consists of an 8-turn coil attached to a patient’s chest. As a breath is inhaled, the area of the coil varies from 0.120 m2 to 0.124 m2. The magnetic flux density of the Earth is 50 x 10-6 T and makes an angle of 22.5o with the axis of the coil. If the patient inhales for 1.59s, what is the average emf induced in the coil during the inhalation? 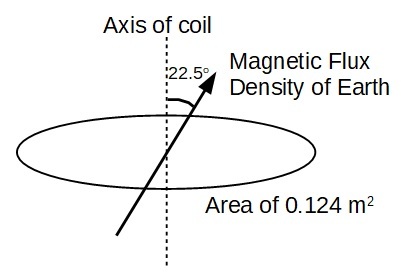 To calculate the induced emf, the magnetic flux linkage of the coil has to be calculated. 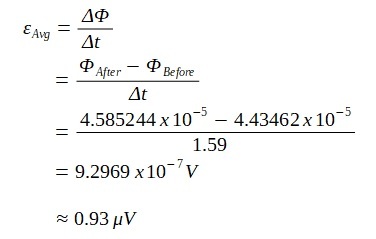 The induced emf can now be calculated.